Competition Clutch Domestic Stage 5.5 - IronMan 0680 Six Puck Iron Rigid - Dezod Motorsports Inc - Home of the automotive performance enthusiast since 2002. The Competition Clutch Domestic Stage 5.5 – IronMan 0680 Six Puck Iron Rigid uses an advanced hybrid iron and carbon friction material that offers comparable holding capacity of the ceramics and bronze materials. This material allows for harsh driving and abuse but it drives smoother than the typical ceramic and bronze material. There is less wear on opposing surfaces with smoother engagement and disengagement. 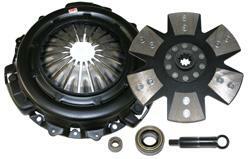 This is an extreme duty clutch assembly for the series performance enthusiast who requires smooth engagement.